With each year that passed I became more devoted to Alys, the unmarried daughter. She was less flippant than her brother Logan, and less irresponsible than her sister, Mrs Costelloe. She seemed to me to possess all the simple kindness which I still cherished in spite of Pembroke Lodge, but to be devoid of priggery and prejudice. I wondered whether she would remain unmarried until I grew up, for she was five years older than I was. It seemed unlikely but, I became increasingly determined that, if she did, I would ask her to marry me. 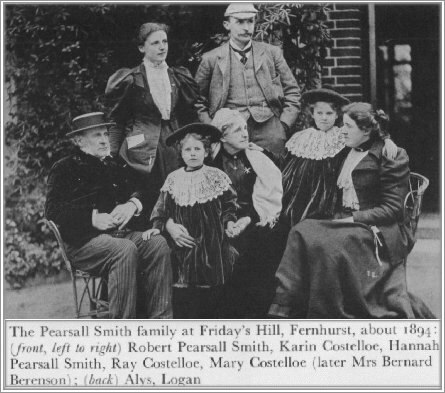 Once, I remember, I drove with her and her brother to Leith Hill to visit Judge Vaughan Williams, whose wife wore an Elizabethan ruff and was otherwise surprising. On the way they elicited from me that I believed in love at first sight, and chaffed me for being so sentimental. I felt deeply wounded, as the time had not yet come to say why I believed in it. I was aware that she was not what my grandmother would call a lady, but I considered that she resembled Jane Austen's Elizabeth Bennett. I think I was conscious of a certain pleasurable broadmindedness in this attitude.